Two opposing bellows in the Model DP differential pressure switch result in maximum sensitivity, quick response to changes and good vibration resistance. Choice of brass or 316 stainless steel assures broad media compatibility. Setpoint adjustment is easy thanks to external knobs and large, clear scale reading directly in psid. Wetted Materials: Brass on ranges 61, 62, 63 or 316SS on ranges 62E, 64E 65E. Temperature Limits: -10 to 180°F (-23 to 82°C). Enclosure Rating: General purpose, weatherproof or explosion-proof. 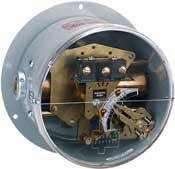 Switch Type: Mercury or snap switch, see "Ordering" page. Electrical Rating: See "Ordering" page. Conduit Connection: General purpose: 1/2" hole for conduit hub. Weatherproof: 1/2" conduit hub. Explosion-proof: 3/4" NPT female. Process Connection: General purpose and weatherproof: 1/8" NPT female. Explosion-proof: 1/4" NPT male. Weight: General purpose: 5 lb (2.3 kg). Weatherproof: 7 lb (3 kg). Explosion-proof: 25 lb (11 kg).